The 34.14 metre motor yacht Black Gold, listed for sale by John Varga at Westport Yachts, has been sold with Moran Yacht & Ship introducing the buyer. 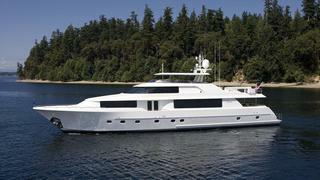 A Westport 112 Raised Pilothouse motor yacht she was delivered in 2011. She features naval architecture by Jack Sarin, while her exterior styling is the result of a collaboration between Westport and Taylor Olsen. Black Gold’s in-house Westport interior layout offers plenty of space on board thanks to her 7.24 metre beam. She has accommodation for 10 guests in five cabins, with an on-deck master stateroom along with four additional guest staterooms. All of the cabins feature en-suite bathrooms. This configuration includes two queen beds, two double beds and one cabin with twin beds making her an ideal layout for charter. She also offers accommodation for up to five crew. She offers extensive interior spaces for either relaxed or more formal entertaining with a light saloon and an elegant dining area. Having been well maintained she also features an up to date Kaleidescape music and movie player. Her teak decks offer plenty of space for enjoying the outdoors with multiple sun pads both in the sun and shade. She also has a large dining table aft which is capable of seating up to 10 guests. She is powered by twin MTU (16V2000) 2,000hp engines and has a top speed of 26 knots. Used sparingly she has only 1000 engine hours and completed a full MTU 1000 hour service in February this year. She has a nautical range of 2500nm at 12 knots and with a draft of 1.6 metres means she has the flexibility to visit shallower cruising grounds. Black Gold was asking $8,695,000.